I recently successfully soldered a 4mm-by-4mm QFN chip using my toaster oven but without solder paste. There were two reasons to avoid solder paste. The first is that somebody threw away the solder paste syringes that I stored in a fridge (the solder paste was also beyond the expiration date, but still worked okay). The other reason, which is more important, is that reflowing QFN chips without a stencil using solder paste proved difficult. The problem is to put an appropriate amount of solder paste on the pads (that is, to put little enough). When I put too much, which happens very easily, solder bridges form and are hard to remove. I needed to solder a QFN chip to an evaluation board I designed and I decided to try to do that with normal solder. I tinned each pad with normal solder, including the center pad. I made sure that the amount of solder on the pads was uniform; every pad had a little hill of solver (probably 0.25mm or so high). I then added flux, placed the chip on the board, the reflowed it. An inspection of the joints under the microscope showed that there was too little solder on the pads; the solder was completely flat on the pads. I added more solder to the pads with a soldering iron with a needle-point tip (Hakko 888 with a T18-I tip). I also added solder to the center pad through a via to the back side of the board. Following this fix, the chip was soldered correctly (this was verified by correct operation of the board). The rest of the components were soldered using an iron, but perhaps I should have reflowed them too. The is the picture of the board; it was designed to evaluate an AX5031 transmitter using a Texas Instruments Launchpad. I forgot to order a 16MHz crystal with a footprint that matches the boards, so I improvised with a larger crystal. In a discussion in Facebook, Ohad Miller commented that he solders similar QFN chips using a soldering iron. He solders the pads pretty much like I added solder to the pads. He solders center pad using an large via (he makes these vias large specifically so that it is possible to solder through them). I didn’t try this but it seems like a good way to go. A huge range of electronic devices now come only in surface-mount (SMD) packages, so techniques for prototyping with these devices are often useful. Also, most ready-made boards use these devices, so if you need to modify such a board, similar techniques are helpful. The picture above shows such a prototype. I built the circuit on a piece of SMD prototyping board made by BusBoard. The squares are 50mil (0.05 inch) by 50mil. The small square device at the top is a 1.2mm by 1.2mm Hall-Effect sensor; its 4 contacts are spaced 0.65mm apart. The larger device next to it is a MOSFET in an SC59 package. The brown capacitor next to it and the two black resistors are in 0603 packages. It’s a simple circuit. It was not hard to prototype like this, and testing it gave me very useful insights and a lot of confidence before designing a PCB and ordering a batch of assembled units to test. Obviously, some SMD packages are easier to prototype with than others. The same MOSFET (a DMN1019) also comes in a smaller 1.95-by-1.95mm package, so in the PCB design intended for automated assembly, I used the smaller package to save space. I bought the SC59 device simply to make prototyping easier. The picture below shows another example of the same technique on the same type of prototyping board. This circuit is a 1.8V regulator, and here too the capacitors are 0603. The picture also shows how I hacked a ready-made board, a USB-to-UART bridge with an FTDI FT230X chip. The chip can support a variety of I/O voltages, but the board is wired for 3.3V and there is no easy way to change this. I needed the UART to work at 1.8V, so I added the regulator on the BusBoard. But I also needed to cut a trace between the 3.3V supply on the ready-made board and a pin of the FT230X, and to connect to that pin the 1.8V supply. The red wire carries this supply voltage to the pin. The thin hookup wires I use are old wire-wrap wires. They are often convenient. To connect to the pin of the QFN chip the thin wire was certainly helpful. These techniques are useful for simple circuits (or in these case, for small parts of circuits that are attached so a hacked board), but it is hard to scale this up to more complex circuits. For complex circuits, it is better to design a PCB and have it manufactured, even for a prototype. A PCB makes it possible to use a much wider variety of packages than is possible with the BusBoard boards, and the solder mask makes solder bridges much less likely; the lack of solder mask is one of the disadvantages of the BusBoard technique. To end, here is another example of SMD prototyping, here an SPI NAND flash chip, placed upside down on a conventional 0.1″ prototyping board. It’s ready to be hooked up to a microcontroller for testing. It’s 8 pads are spaced about 1mm apart. Itamar Melamed and I designed a second generation front-end unit. 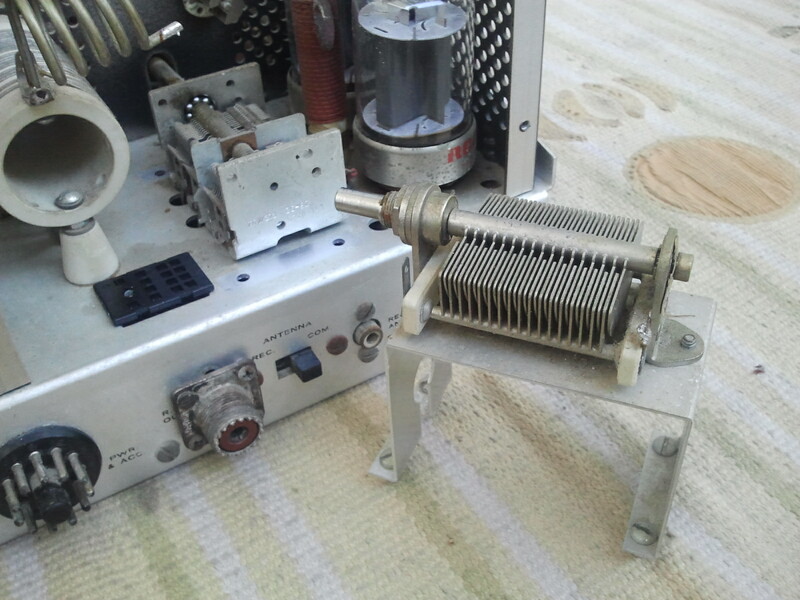 It contains a SAW filter, an RF limiter to protect the filter and the radio, and a bias tee with a DC limiter, allowing the unit to be used with both active antennas and antennas that present a DC short. It is small and fits within a USRP N200. The full details are available at http://dx.doi.org/10.1016/j.icte.2017.01.002. Quite a few modern wideband receivers do not have a selective front-end that can receive weak signals while rejecting strong out-of-band signals. An article I published in the Jan/Feb issue of QEX explains the issues involved in the design of external front ends for such receivers and describes a concrete front-end unit and its performance. The unit we describe was designed for a Universal Software Radio Peripheral (USRP) N200 radio with a WBX RF daughter card and for 431 to 435 MHz signals, but the design can be easily adapted to other bands. It is also suitable for many other radios, including low-cost USB dongles based on the RTL2832U (so-called rtl-sdr dongles). 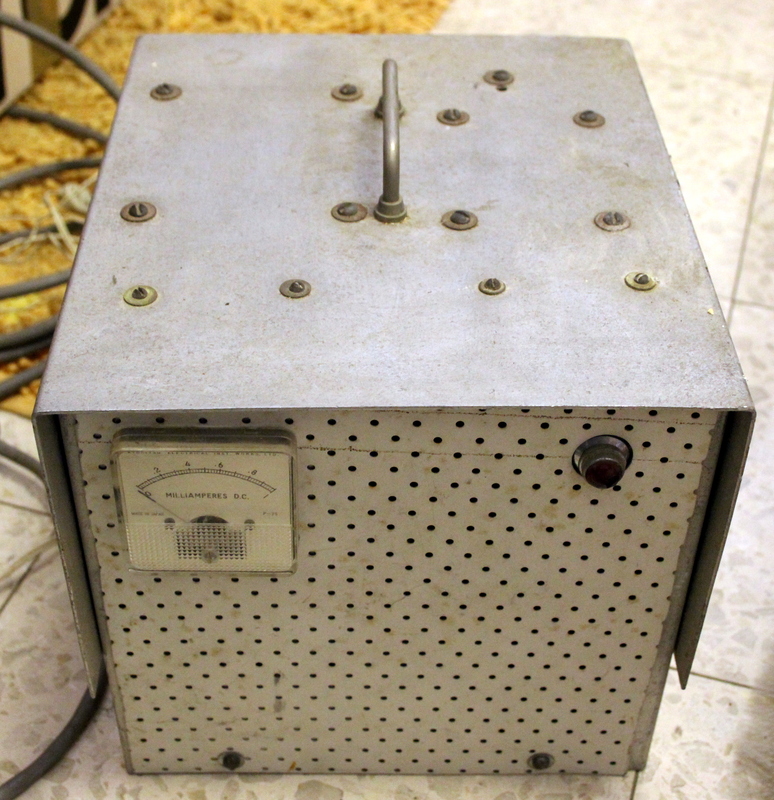 Fairly unique features of this design are the use of a low-cost but highly selective SAW filter and the use of a limiter to protect both the receiver and the SAW filter. I also used a fairly expensive helical filter, but I now think that replacing it with a simpler and lower-cost filter would not hurt performance much. The full article is available on my university web site, with permission of the publisher (ARRL). If I get interesting feedback on the article (I am sure the design can be significantly improved), I will post it here. Earlier posts in this blog described the mast-mounted LNA that I normally use with this front end (and a small improvement to the LNA), how I prototyped the front-end, on designing and manufacturing PCBs for it, and on reflow soldering in an unmodified toaster over, which is how I build the front-end units. As you can see, it’s been a long learning process for me. 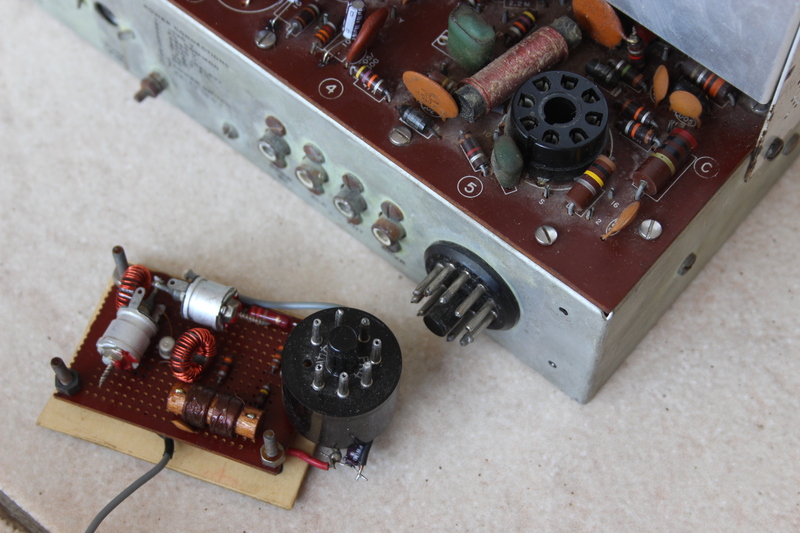 Restoring the SB-101 transceiver that I received together with the HP-23 power supply was more challenging than restoring the HW-32A, mostly because the 101 is mechanically much more complex. Like the restoration of the 32A, this restoration was not 100% successful, but the transceiver is working. It receives just fine. It also transmits, but there is still a remaining problem on the transmit side. When I got it, it was really in a terrible shape. It was covered with a thick layer of dust. 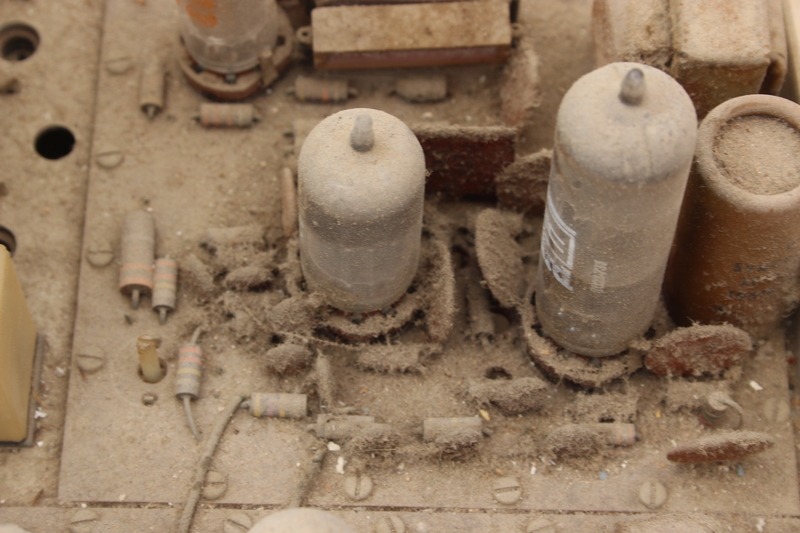 The dust covered not only the outside of the transceiver, but also everything on the top side of the circuit boards; dust entered the enclosure through the perforated cover. The bottom side of the boards was clean, thanks to gravity I guess. Cleaning up the dust is easy (and satisfying; it fun to see the electronics come out of the dust). I tried to remove all the knobs so I could remove the front panel, but I could not release the set screw of one of the knobs. I did not want to ruin the knob, so I left it attached. I did not manage to remove the front panel, but it did not matter at the end. With the unit clean, I replaced the electrolytic capacitors, as I did on the HW-32A. There aren’t many of them and most were easy to replace. One 10uF 10V cap was burried under a jungle of wires near the front panels. It was very hard to get so I initially left it in the circuit. It’s an audio-frequency cathode bypass in the microphone amplifier, and I thought that even if is shorted, it would not cause further damage. Eventually I replaced it too. With the electrolytics replaced, I powered the transceiver. It received okay on most bands. The only band that was dead was the 29.5-30MHz. I think it’s heterodyne oscillator is not working; maybe the heterodyne crystal is bad. There’s only FM activity in this band and the transceiver does not support FM, so it did not seem worth it to try to fix this. Also, the VFO dial was 100kHz off, but I left this for later. The next step was to fix the mechanical problems. There were several. The most difficult one to fix was a missing shaft coupler for the finals tuning capacitor. The 101 used an insulated coupler. In the unit I had, it was badly broken and parts of it were replaced by some solidified goo, perhaps old epoxy. 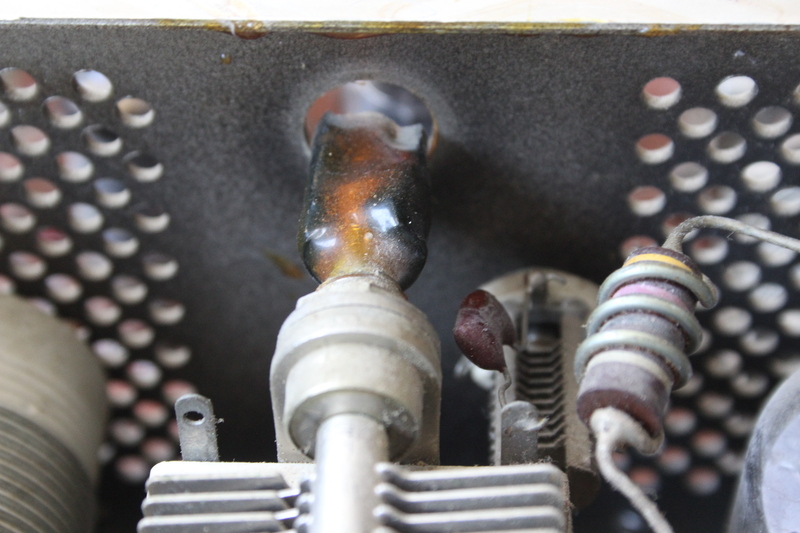 The remains of the coupler were not working: the panel shaft rotated without turning the capacitor. I removed all the broken pieces and the goo and tried to find a replacement coupler. I did not find out. I did have a suitable aluminum coupler, but it had a large diameter so it would not go through the hole in the shield of the final amplifier. I tried to make a coupler myself from soft aluminum tubing, but it did not work (the set screws slipped). I tried to remove the cover but it’s held by hard-to-reach screws. Eventually, I removed the variable capacitor (which required disconnecting an inductor and a couple of capacitors that were soldered to it), attached my coupler, and mounted it back. The next step was to replace the three o-rings that couple two front-panel knobs to three variable capacitors (final loading and the driver/preselector tuning). The o-rings that came with the transceiver have completely disintegrated. I tried to locate replacements (they are available on eBay), but decided eventually to use a nylon cord instead. 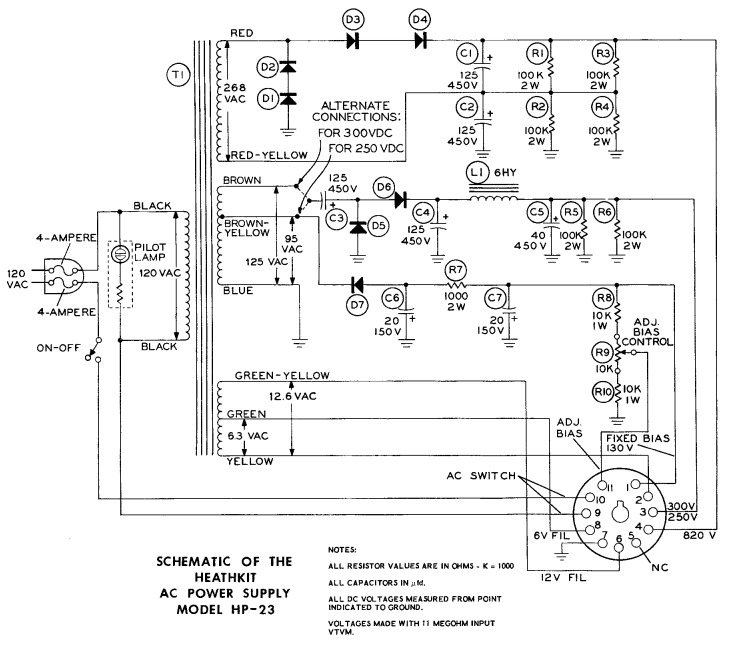 Diagrams and pictures on the Heathkit Yahoo group helped a lot. With o-rings replaced, I could try the transmitter (without the o-rings, there is no way to tune the driver and the loading capacitor of the final tank circuit). The transmitter seemed to work fine on 3.5, 7, and 21MHz, but experienced bad oscillations on 14MHz. On 28MHz, it didn’t oscillate but it only produced a few watts (as opposed to over 100 on 3.5, 7, and 21). You see that it oscillates because after you tune it for maximum output, it keeps producing output even if you turn the drive knob all the way down. I described the situation on the Yahoo group and many folks responded with useful advice (many thanks to Bill Harris, Bob Burns, Mike Waldrop, Timothy Bolbach, and Kevin Schuchmann). They included adjusting the heterodyne coils, the driver/preselector coils, ensuring that the driver PC board is making good contacts with the chasis, and improving the grounding of the PCBs that carry the crystals and coils that the band switch switches. I adjusted the coils to the extent that was possible. This included doing the initial receive-mode adjustment of the heterodyne coils (at first I thought that this was it) and of the driver coils. 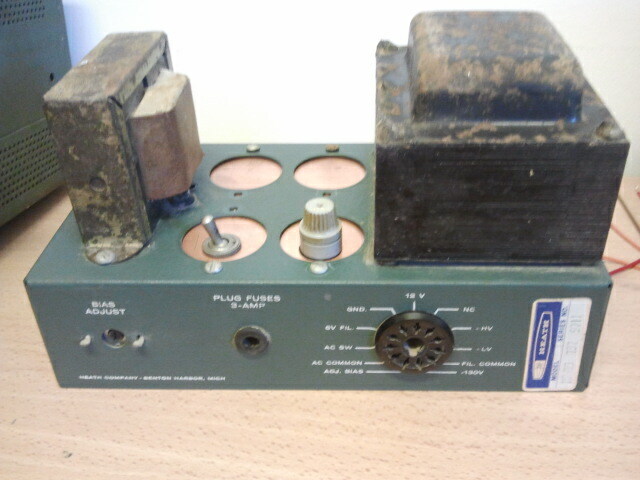 This cured the problem on 14MHz but oscillations appeared on other bands. I tightened the screws that attach the PCBs to the chasis, but I could not check that there are spring washers between the PCB and the chasis, because most of the nuts on the screws that hold the driver boards are nearly impossible to reach. I did improve the grounding of the band-switch boards, but without soldering them to their brackets or replacing the brackets (this mod was recommended by Heathkit decades ago, but my brackets were both impossible to solder and very hard to remove). In the picture below you can see these boards. The exposed wire that connects them near the bottom of the chasis is from the original build. I added thicker multi-strand ground wire. At some point I tried to add a copper sheet on this side to ground the boards even better, but it didn’t seem to do any good. I also discovered a couple of other problems associated with the driver. The wire that serves as a gimmick neutralizing capacitor was not placed in the hole it should be in. Also, the shield of the driver was missing. I corrected the positioning of the wire and moved a shield from another tube (V1) to the driver. I build a homemade shield for V1. These improvements eliminated the oscillations, but the transmitter was still a bit unstable. The instability shows up as unstable grid current in tune mode (and CW). Plate current and output power are also somewhat unstable. This instability amplitude-modulates the CW or tune carriers and I can hear it in an AM receiver. It sounds like scratching or a bad contact in an audio system. The unstable grid current does not allow me to do the fine tuning of the coils, which is supposed to be done by peaking the grid current. I also tried to diagnose and perhaps to fix this in a couple of other ways, such as improving some suspect solder joints and trying to adjust the final’s neutralizing capacitor (this seemed to do more harm than good), but nothing eliminated the problem. I also tried to replace the driver tube but this didn’t help either (it’s kind of a miracle that I had a spare, but I did) and to clean and re-solder the anode caps on the finals. At this point I gave up trying to fix this. The textbook solution of trying to replace the brackets that hold the bands-witch boards, solder the boards to the replacement brackets, and checking the screws and nuts and washers that hold the driver board to the chasis required more disassembly than I was prepared to do. These boards are not designed to be removed, and some of the screws that I had to remove to disassemble this part of the transceiver were really jammed. I guess it is possible to fix this problem, but it’s not easy. 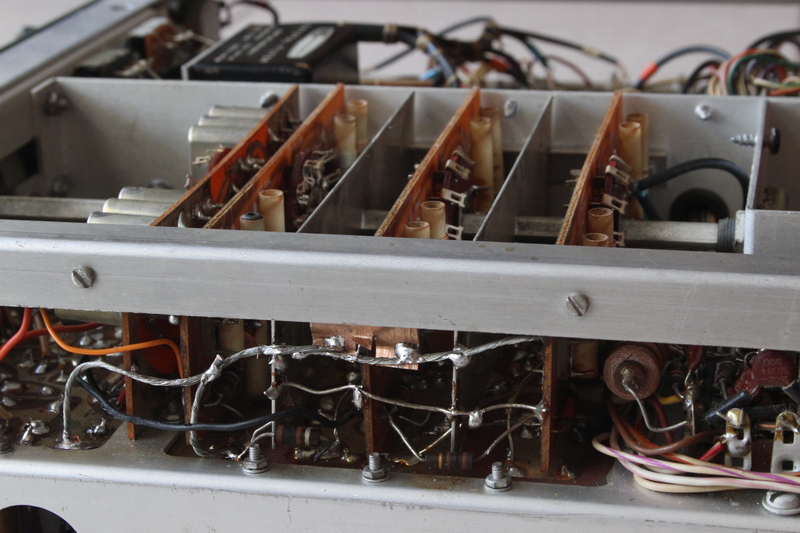 Also, from all the Heathkit service bulletins and all the experiences of the people on the Heathkit Yahoo group I realized that the SB-101 suffers from some serious design problems in the driver and band-switch. This kind of discouraged me. I replaced two connectors as part of the restoration. I replaced the UHF antenna socket with a BNC. 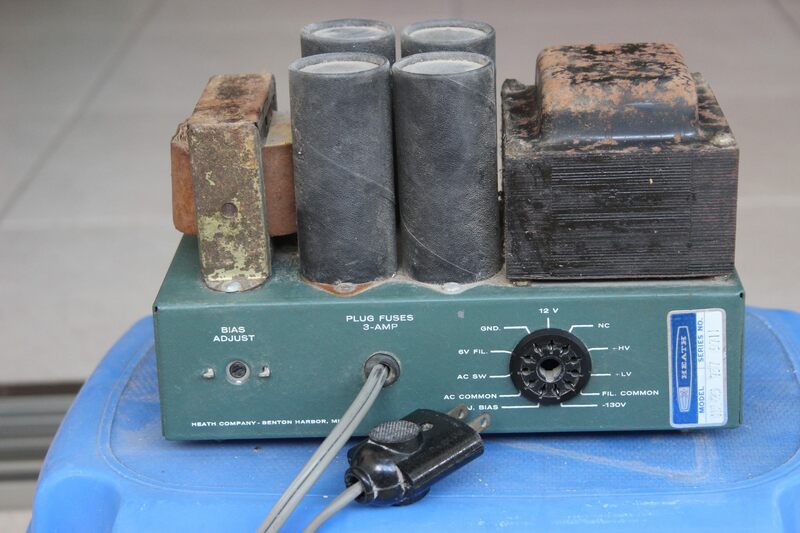 The old socket was not original (the original was an RCA) and was not well attached to the chasis. A chasis-mount BNC socket fit the hole, is well attached, and more convenient. I replaced the weird Heathkit microphone connector with a more conventional 4-pin socket for which I had two plugs available. The end result is a transceiver that receives and transmits on all bands (apart from the 29.5MHz sub-band), but with amplitude variations on transmit. Transmit performance was sufficient to chat with a friend for a while, and this was good enough for me. With the HP-23 power supply working, I was ready to bring my HW-32A transceiver back to life. I bought it together with a home-brewed power supply and a Heathkit SWR meter when I was a teenager in the early 1980s (more precisely, my mother bought it for me). 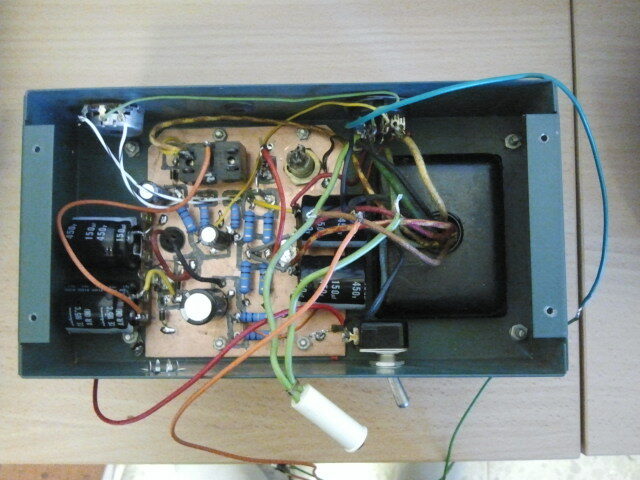 The transceiver was originally a kit, but I bought it built. I used it extensively for a few year, after which it spent a few decades in a box. The home-brewed power supply seemed reasonably decent on the outside, but was a scary mess on the inside I did not dare plug it in (after my teenage years, that is), but the HP-23 solved the problem. The transceiver was pretty clean on the inside. It was modified in a couple of ways, some of which I knew about and some that I did not know about. On top of the enclosure I installed a large 115VAC fan, to keep the finals cool. 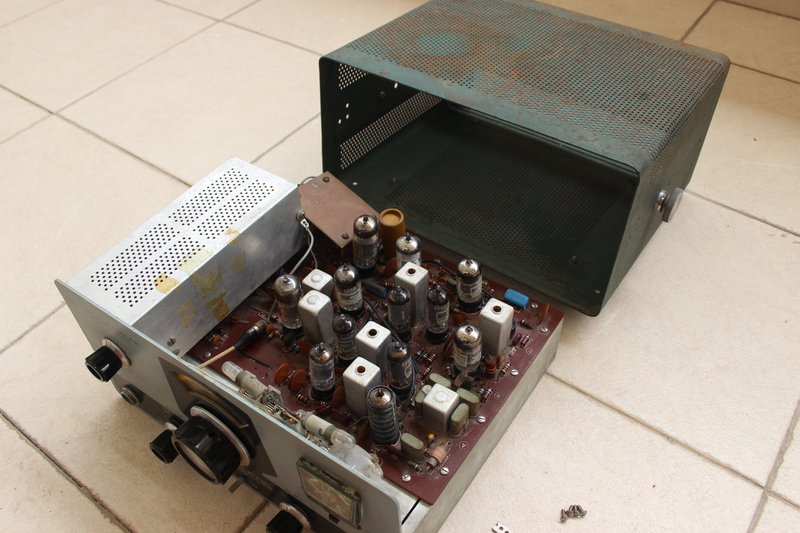 It was ugly and the transceiver was designed to operate without a fan, so I removed it. I was happy to discover that I attached it with thin screws that went through the perforation in the enslosure; I did not drill holes or enlarge them. The fan is not shown in the picture above, but you can see another mod: the little unetched PCB facing up on the back. 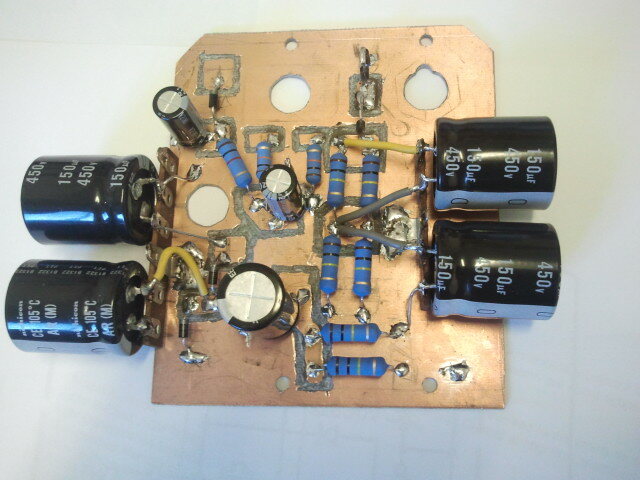 This is a receive preamplifier that I build (and completely forgot about). It was plugged into the calibrator socket in the transceiver. The socket provides it with 12VAC feeds back the amplified signal to the receiver. I think the transistor is a dual gate mosfet, but I didn’t check carefully. I removed this mod, both because it was mechanically unsound and because I wanted to get the transceiver back to a close to original condition. 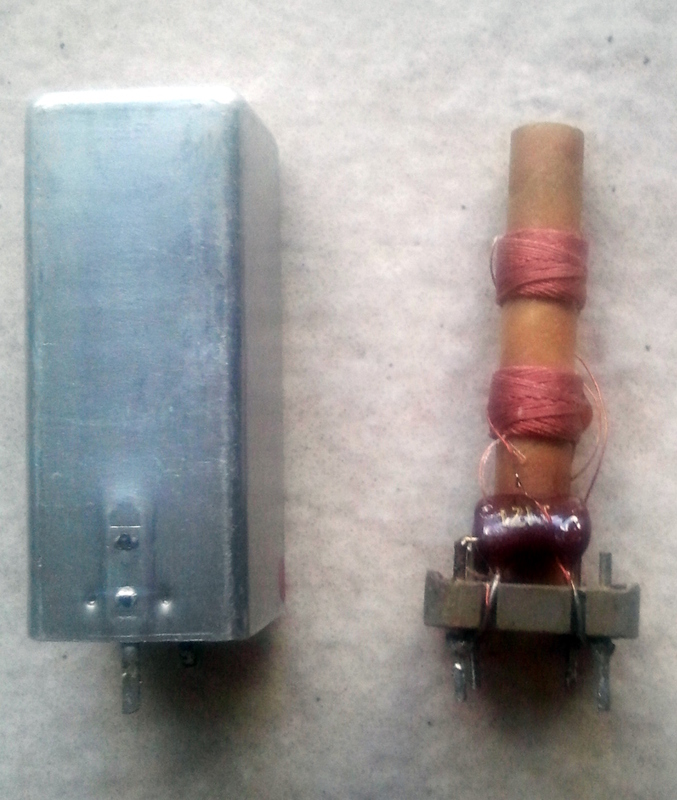 The transceiver used three electrolytic capacitors which I replaced before powering it up. With these replaced, I powered up the transceiver and started testing it. The receiver worked fine, but was about 100kHz off frequency. The adjustment for that is a coil and once I borrowed a suitable plastic tuning tool for it, I was able to align the frequency pretty accurately. The transmitter also seemed to be in a decent shape and produced some output. After some testing, however, the receive-transmit relay stopped switching. I am not sure what happened. I think I operated the transceiver for a while on the 300V setting of the HP-23 rather than on the 250V setting. This might have damaged some of the tubes; I’m not exactly sure what happened. The relay did not seem completely dead, however. It is an open-frame relay, and by applying a bit of force I was able to get it to switch. The voltages across it seemed reasonable. I eventually resorted to adding a 10uF electrolytic capacitor in parallel with R28, a 12K resistor that is connected in series with the relay. In receive mode (the relay is not energized), the capacitor is discharged. When the triode turns on to activate the relay, current starts to flow but the voltage across the capacitor is still close to zero, so the relay sees a larger voltage than it does when connected in series with the resistor. As the capacitor discharges, the voltage across the relay drops, but it remains large enough to hold the relay. 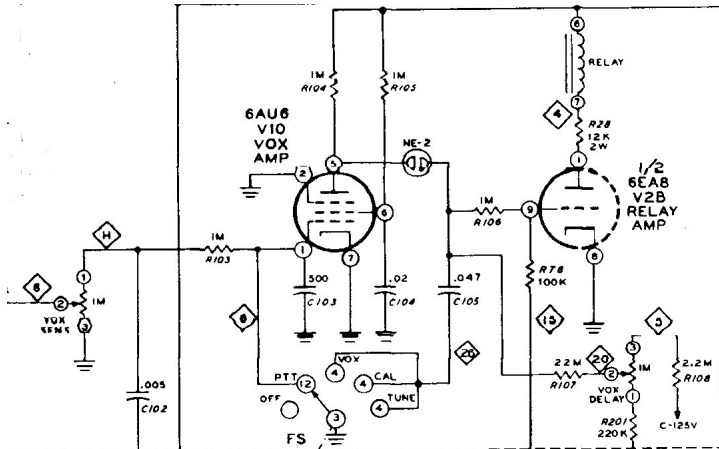 When the triode turns off, the relay drops out almost instantaneously. Problem solved. When inspecting the bottom side of the circuit board I noticed another mod: a white-blue wire was attached to a white-yellow wire on the other side of the chasis by a piece of black wire. 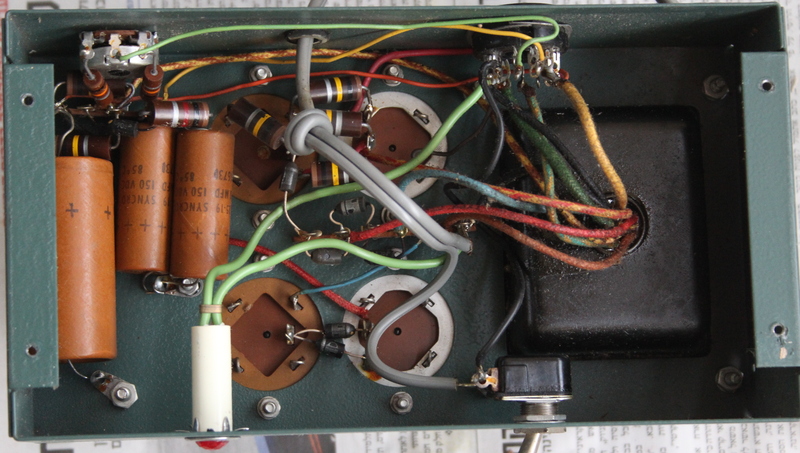 This could not be part of the original circuit, because Heathkits never had different-color wires connected together. I looked up these wires by color in the assembly manual and eventually discovered that the white-blue one carries signal 26 in the diagram above. It grounds C105 to allow voice-activated T/R switching. In my transceiver it grounded instead the white-yellow wire, which turned out to be connected to the amplifier T/R switching pin on the power connector. The white-yellow wire was supposed to get grounded during transmit by a pole of the relay. At this point I noticed that the relay in my transceiver was a DPDT one; the manual shows a 3PDT relay. There was no pole to switch the amplifier, so somebody hooked this wire up to be grounded in VOX and Tune modes. My transceiver used this switched signal to turn on the fan, not an amplifier. I left this mod in since there was no way to switch an amplifier anyway. Also, one of the terminals of the neon lamp in the VOX circuit is broken in my transceiver, so VOX is not working anyway. Not grounding poing 26 has no effect anyway. I had one more difficulty with the transceiver. The successful tuning of the VFO frequency encouraged me to follow the rest of the tuning procedures in the manual. Some of them involved tuning the cores (called slugs in the manual) of coils and transformers. Some of them were almost stuck, but I was able to gently free them and tune them. As far as I remember, none was really off. One of them, however, was very much stuck. tried to turn the core, but at some point the stuck core caused the entire coil to turn, and this broke one of the the terminal connections (the coil was inside an aluminum shield, but I could feel that something turned and tore, and a multimeter check showed that one side of the transformer was an open circuit. Fortunately, these transformers are so large that it was easy to solder it out of the circuit board, open it up, solder the torn wire, and put everything back together. It was a good lesson in just how repairable these transceivers are. I did a bit of tracing with an RF probe and with a scope to try to figure out why the output was so low. I was not able to pinpoint the problem and since at this point the SB-101 was in a much better shape, I decided to leave the HW-32 alone. It is now functional and in close to original condition. The receiver seems okay (I didn’t check sensitivity, but it certainly picks up signals, even weak ones). The transmitter works but produces very little power. It will do for now. In this final picture you can see the transceiver with the Motorola microphone it came with. It uses the original Heathkit 2-pin connector. The speaker is the one I used with the transceiver years ago and it still works fine. It has a headphone socket (that does not mute the speaker) and a separate mute switch. Pretty useful. The red paint is my work from many years ago. I think I used red because simply because we had a can of red paint at home back then. 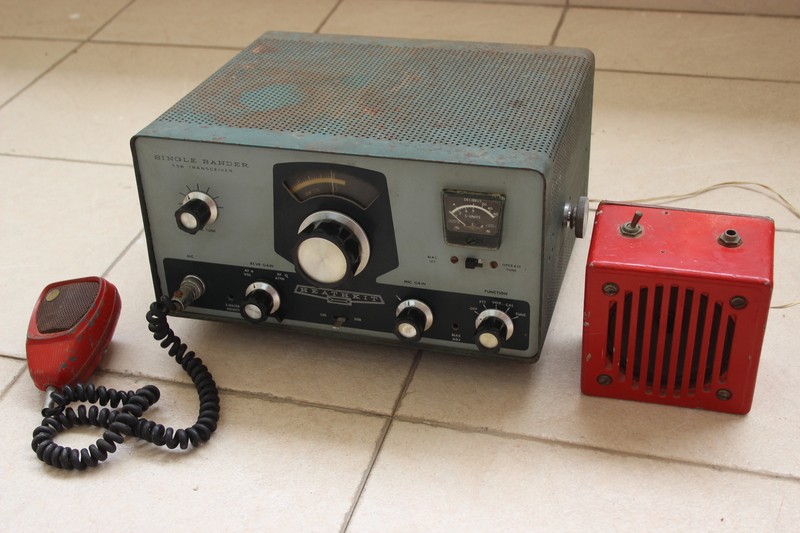 A while ago somebody gave me an old Heathkit SB-101 transceiver and a matching SB-600 speaker with an HP-23 power supply mounted inside the speaker. They were pretty dirty and the power cable that connects the transceiver and the power supply was missing. I cleaned them up and they came out pretty nice visually. The transceiver has some mechanical problems (missing rubber belts, a melted shaft coupler, etc), so I left it alone for now and decided to restore the HP-23 first. 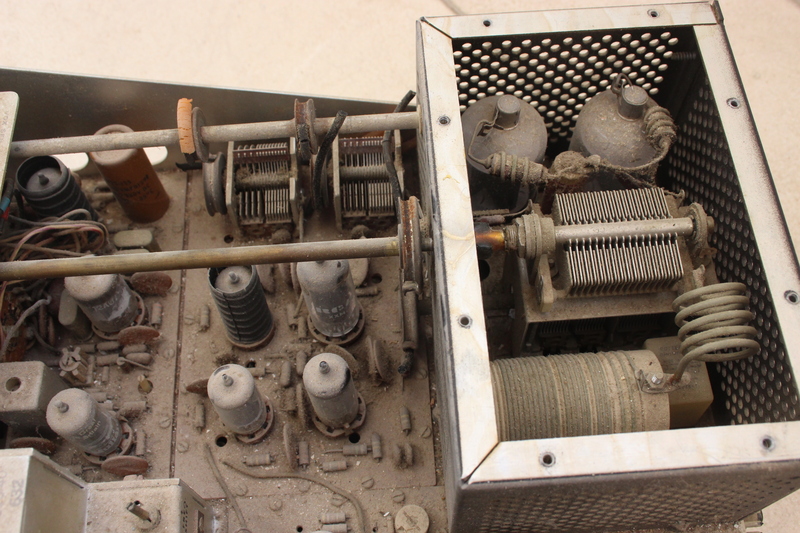 The power supply looked great after cleaning, except for a minor rust on the metal covers of the transformer and choke. I think that the fact they were covered in dust for a long time (most likely decades) brought on the rust. 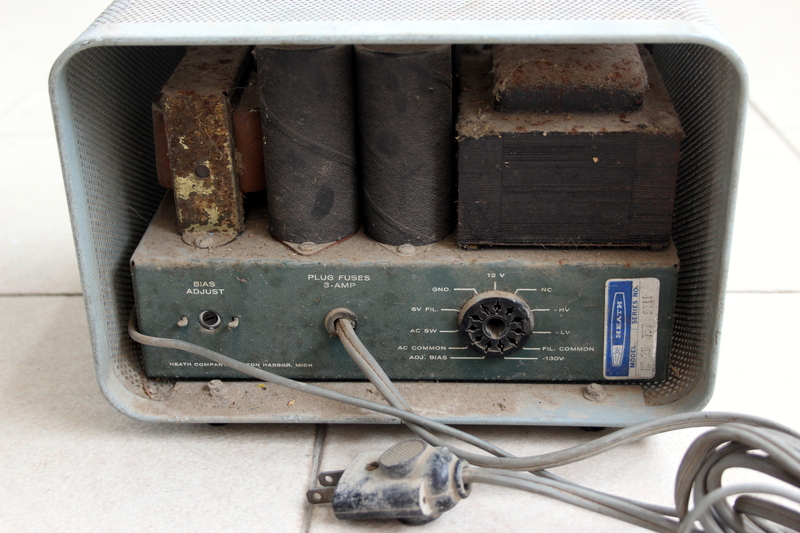 In equipment this old there’s a good chance that the electrolytic capacitors are gone. If the caps in the power supply short, this can destroy other components, so it’s not a good idea to just turn the unit on. 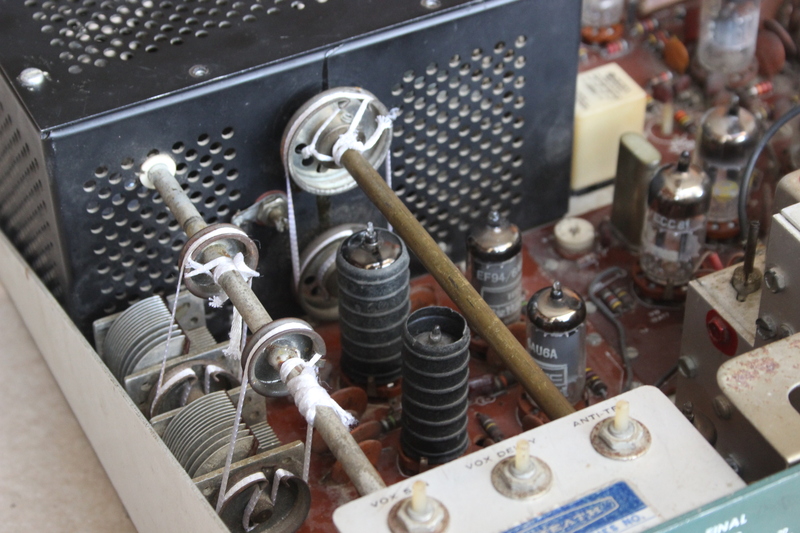 I did some research on the internet and discovered that there is a procedure to restore old electrolytic capacitors (see, e.g., here and here). But it is slow, requires disconnecting them from the circuit, and it does not always work. So I decided to replace all of them. This brought up two more questions: how to install the new caps, and whether to also replace diodes and bleeder/filter resistors. The inside of the supply looked clean and in a good shape, but on the other hand these components are inexpensive and easy to replace. Resistors sometimes drift in value, so replacing them might bring resistances closer to spec. Diodes don’t typically suffer significant damage over time, but I could replace the old 500V diodes with 1000V ones. I decided to replace the diodes and resistors, which means that I could really empty out the inside of the chassis which would give more flexibility in terms of installation options for the new caps. 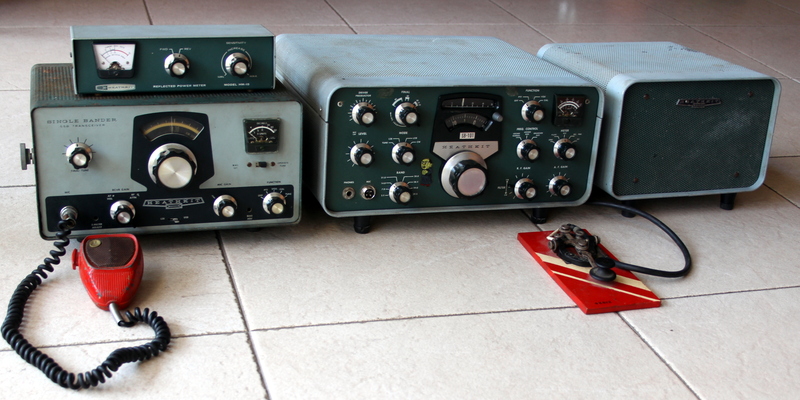 Bob Hanway sells a kit to replace all of these components in the HP-23 and its variants. The kit is based on a PCB that is installed inside the emptied chassis. I decided to use a similar approach and to use a PCB, but to surface-mount all the components. The resistors and diodes and some of the caps I got have leads so they are intended to be mounted in through-hole PCBs like Bob’s, but if you are building by hand it’s easy to solder them to PCB islands on one side of a PCB. This meant that the other side could be all ground and could therefore safely seal the holes in the chassis left after removing the four large caps. The replacements for the 4 large caps are not through hole, but have snap-in terminals, so my SMD-style mounting method did not work for them. What I eventually decided to do was to solder them to the terminal strips that I removed from the old circuit and to solder the terminal strips to my PCB. Here is what the assembled PCB looked like with all components soldered in. I started making the PCB with the “hobby knife” method, but it was slow, so I switched to removing copper using a Dremel-like rotary tool with a round diamond head. It was easy and took only minutes. It did generate nasty dust, so if you use it (or in general, if you use these diamond heads on anything), you may want to wear a dust mask. Here is the circuit diagram of the HP-23. With the actual construction over, I was worried about two things. One was the possibility of a breakdown in the old transformer. The other was the possibility that I made a mistake in the construction of the new PCB. The transformer is connected to the mains, and the circuit board is supposed to supply over 800V, so the possibility of faults scared me. I therefore checked transformer and the circuit board separately and carefully. I started the testing of the transformer by connecting the output of an 11V isolated transformer to its primary. That is, the transformer sees 11V at 50Hz (that’s the line frequency here) rather than the 115V at 60Hz it is designed for. I tested the voltage on the secondaries. They were about 10 times lower than specified on the schematics. This told me that the transformer is working. The test AC voltages lower than 30V, so it was very safe. The next step was to test the transformer at 115V, but with a 230V 60W incandescent bulb in series with the transformer (a 115V bulb would have been better but I did not have one). This dropped the voltage on the transformer to about 73V. 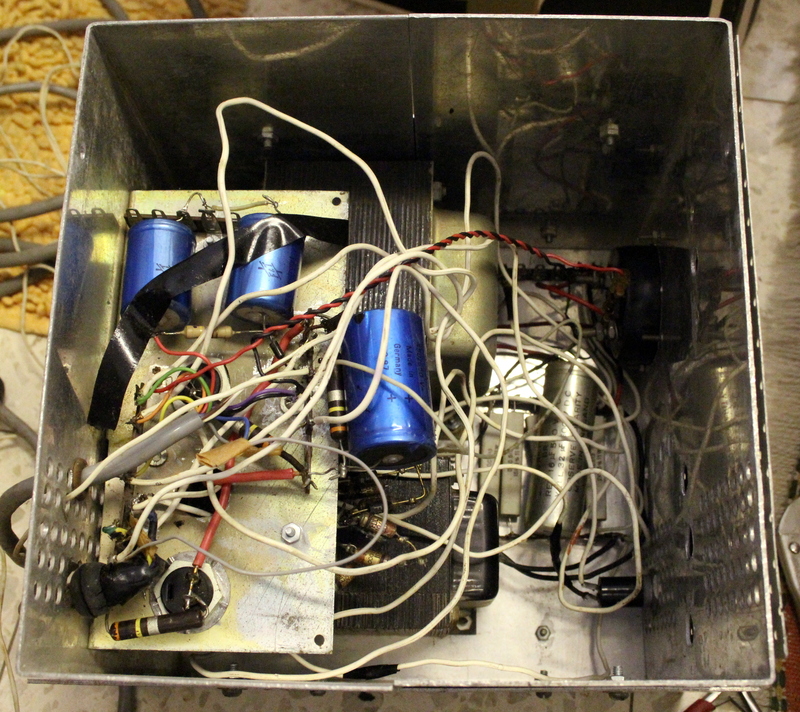 It still worked fine, which meant that the insulation in the transformer is in a reasonable shape. Michael Luft suggested connecting a bulb in series; even if the transformer shorted, the entire 115V would fall on the bulb rather than on the AC mains. The transformer seemed fine, but is my new implementation of the rest of the circuit correct? I tested each section separately using the 11V transformer. All three (820V, 250/300V, and -130V) worked fine. I mounted the PCB inside the chassis and wired it to the transformer and to the large choke. I again tested everything at low voltages by connecting the primary to the 11V transformer. Everything worked correctly, at 11V. I was ready to connect the rebuilt HP-23 to 115V. The mains voltage here is 230V, so I needed to use a step-down transformer. I did the first test with a tiny step-down transformer that can only deliver 15W or so, hoping that if something goes wrong, the step-down transformer would go before the HP-23. Output voltages were about right, so I switched to a 500W step down transformer. Everything is still fine, so I guess the HP-23 is working again. 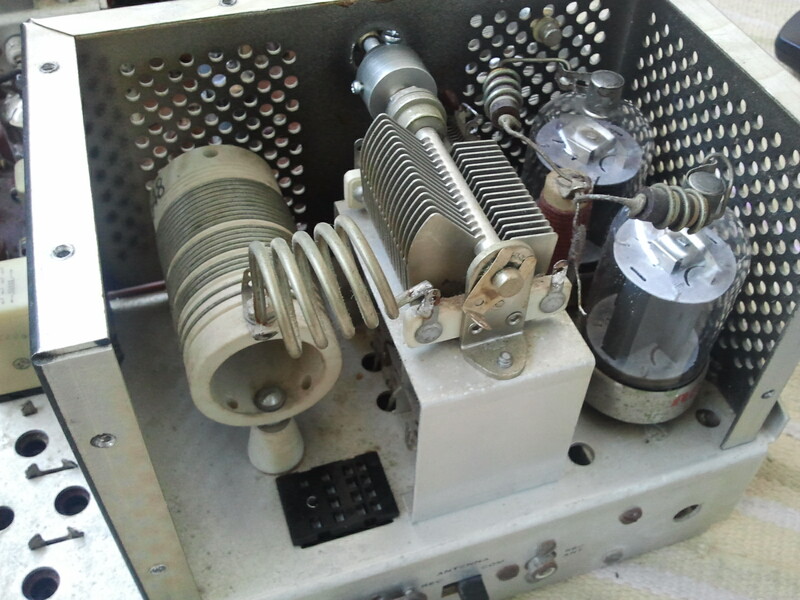 The next restoration projects are the two transceivers and the home brewed power supply. I started taking apart the latter while trying to figure out the schematics in the process (I don’t have any documentation on it; from what I have seen so far it is not a copy of the HP-23).